I'm not lying. This chili has been entered into contests and won. It's that good. What makes it so awesome? It has beer. It has beef and pork. It has celery. And it has a tiny bit of brown sugar. It's cold outside, so whip up some chili tomorrow afternoon and nurse your NYE hangover away. It'll make you feel good and warm and tingly inside. More points if you eat it on the couch in your pajamas and slippers cuddled up watching a movie. Like 'The Hangover'. I got the blu-ray for the stallion for Christmas, and I try to watch it every day. It's hilarious! Not pictured: Beer. Brown Sugar. All Seasonings. Olive Oil. oops. Grab your biggest pot. Put it on medium-high heat and pour in some olive oil. Add the meat. I used ground beef and pork this time. Italian sausage or pork breakfast sausage would also be divine. All total I used 2 pounds. And allow to cook and brown and get all juicy like. Go ahead and add some salt here. About a teaspoon. And mince them all up. And set aside for now. Sometimes I'm lazy and I don't take the meat out. I'll just throw the veggies right on top. Or I'll start with the veggies and then throw in the meat. It's chili. I really don't even know why I feel the need to share something so ludicrous as a recipe for chili with you all, but here I am! Drain some of the fat. But leave a little behind. It's the right thing to do. And spread around to begin sauteeing. And roughly chop. Or finely chop. However rustic you want your chili is totally up to you. And stir it up, baby. Then chop away! Keep the leaves in there - they have so much flavor. You must trust carlyklock. They'll look like this! Oh - and add some salt here. Or 2 minutes ago. Yes, that would be better. And stir it around so everyone gets acquainted. And awkwardly hold out your hand to block the afternoon sun so it doesn't glare and flare up your picture. Time to start seasoning away. Add some ground red pepper to taste. Can you handle it? I probably use a good heaping teaspoon. The brown sugar will help soften the blow a bit. Now add chili pepper. Lots and lots of chili pepper. About 1/4 cup. Stir it all up, and then add the tomatoes. I used a 28 oz. can of both diced tomatoes and whole tomatoes. You can do all whole or all diced or whatever the heck you have in your pantry at the moment. Those whole tomatoes will need some work to break them up and release all their juice. Hop to it! Time for the beans. I use 3 cans, 3 different varieties - black, kidney, and pinto. Open 'em up, pour them into a strainer, and rinse all that weird gunk away. Add to the vegetable/meat/tomato mixture. Go ahead and add some cumin, too, since you forgot it. About 2 tablespoons. ** I'd just like to point out the fact that I could have put this picture up where it belonged and pretended like I didn't actually forget something. Wait, no I couldn't have. There weren't any beans or tomatoes in the pot at that time. Or, I could have to see if you were paying attention. At any rate, I'm just trying to point out how transparent I am with you all. You're welcome. And a small 6 oz. can of tomato paste. And for the piece de resistance (that really doesn't have the same effect without all the accents): BEER. This particular can of Keystone Light is probably a good year and a half old. Goes to show how much we dig the Keystone Light nowadays. Usually I would use Boulevard (local KC brewery) Pale Ale. But, as it turns out, this was the only beer in the whole house. Not very Stallion-like is it? Well, maybe that's because someone was being super Stallion-esque and saving up to buy a ring. Maybe. For those of you paying attention: Yes, that's right, we even moved with this can of beer. I think the aged beer totally added that certain je ne sais quois to this dish. Totally. Now comes the brown sugar. This is totally to taste and can be omitted if you so choose. I think I typically wind up using about 1/4 cup. Time to stir it all up and let it simmer and meld. After it's simmered for a good 15 minutes, then you can begin to adjust your seasonings. Pump up the red pepper, salt, chili powder, cumin or sugar and get it just right. Do whatever will make your heart sing. You're the one that has to eat it, after all. Now, for the accoutrements. Number one: cheese. Cheddar cheese. This is from Cabot Farm in Vermont, very close to where our family lives. I even think one of my cousins used to work there. It's white cheddar. My uncle once told me that he doesn't eat yellow cheese. Weird. Not so weird...makes total sense! I don't eat yellow cheese now, either. Well, except in unavoidable instances. I love cheese that much. But just think about it - all the good cheeses are white (parmesan, gouda, brie, swiss, pecorino, gruyere, goat, manchego, on and on and on and on). I just blew your mind. Ladle the chili on top of the cornbread, add the cheese, a spoonful of chopped onions, a dollop of sour cream, and a smattering of cilantro. Or what you believe to be cilantro and actually is Italian flat-leaf parsley. Um, yeah, thought that tasted a little funny. Turns out I bought two bunches of the parsley instead of getting any cilantro. Awesome. Pour 2 T olive oil into pot over medium heat. Add meat, season with salt and cook until browned. Remove cooked meat using slotted spoon and set aside. Drain fat, leaving some to sautee vegetables. Add onions, garlic, peppers and celery. Season with salt. Sautee until soft and onions are translucent. Return meat to pot with vegetables. Stir to combine. Season with chili powder, cumin and cayenne pepper. Add canned tomatoes, rinsed beans and tomato paste, stirring to combine. Incorporate 1 can/bottle of beer. Add brown sugar to taste. Allow to simmer at least 15 minutes, then adjust seasonings as desired. I have had this chili and it really is that good! I second the previous comment, and wanted to point out the awesome balancing act of that tomato paste can. 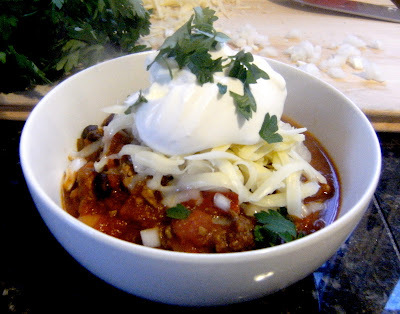 I just made this and it is the BEST chili ever! Thanks for making an honest woman out of me, Renee!